When Plaza Bowling Co. first opened its doors in 1959, bowling was in its heyday. It was the fastest growing sport in North America, and professional bowlers – featured on TV and in the pages of Sports Illustrated – were paid twice as much as NFL players. Everyone bowled. New innovations, such as automatic pin setting machines, made the sport more accessible through the proliferation of new bowling centres. And shows like ABC’s Make That Spare captured people’s imaginations. Though bowling is unlikely to regain its mid-century hype, new owner Trevor Stride hopes that subtle touches of modernity will help revitalize the vintage fivepin lanes, and attract a new generation to the game that once beat out hockey in popularity. “It’s more targeted at people who have probably never been in a bowling league, and are super interested in craft beer, the tunes and the social end of things,” says Trevor. Trevor never intended to take over the family business. After graduating from the University of Alberta, he was invited to help run the original Famoso Neopolitan Pizzeria location on Jasper Avenue. As the chain grew, he moved up the ranks until he became a director of operations. In December 2016, Trevor quit his job and moved back to Edmonton from Vancouver, where he had been living for the past five years. The move (pleasantly) surprised his father, Terry Stride, who had been gearing up for retirement. “I was fully prepared to [sell], until Trevor approached me,” says the senior Stride. To Trevor and his wife it was the right — albeit risky — decision. They had always dreamed of owning their own business, and didn’t want to see the alley leave the family. Not only was it the source of Trevor’s first job and the backdrop to his childhood (his mom would drop him off at the nursery that once occupied the back of the alley, while she threw an afternoon game), but it was his grandfather, Laurie Stride’s, legacy. 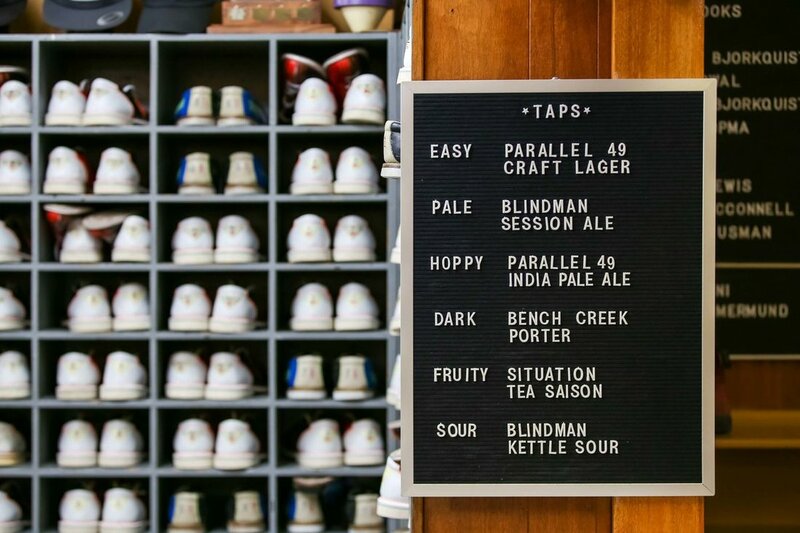 Translating their experiences in the hospitality industry, the couple focused on developing the social aspect of bowling – installing rotating craft beer taps and overhauling the menu with the help of their friends at Drift Food Truck. “It started with us asking: ‘Why are we not compelled to go bowling all the time?’ Because every time we do it, we have a blast. We thought maybe there were some things we could do on the social end to really elevate the experience,” says Trevor. These modifications had never been tried in a Canadian context before. But so far it seems to be working. The low roller leagues have sold out; the average customer has dropped 25 years in age; and the new ownership has been embraced by the community – collaborating on everything from limited edition T-shirts with Flannel Foxes to custom canvas and leather bowling bags with Clo’s General Leather Co.